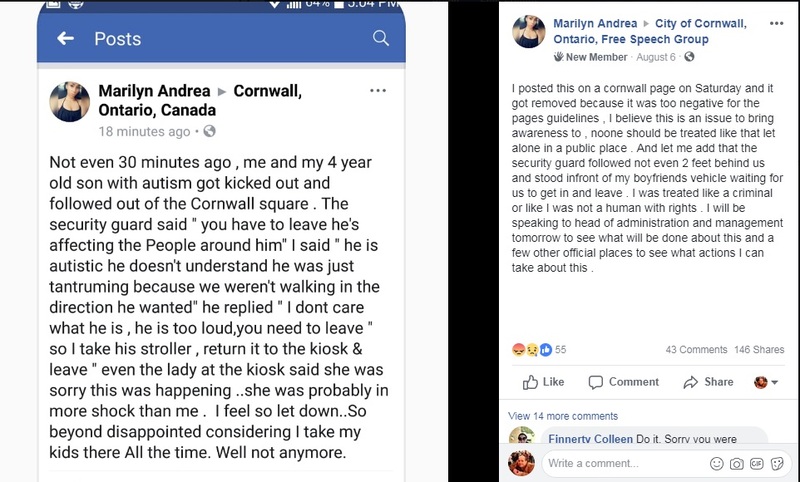 Cornwall Ontario – You’d think as empty as Cornwall Square usually is they’d be happy to have anyone shopping, but sadly an incident occurred involving a mom of an autistic boy. 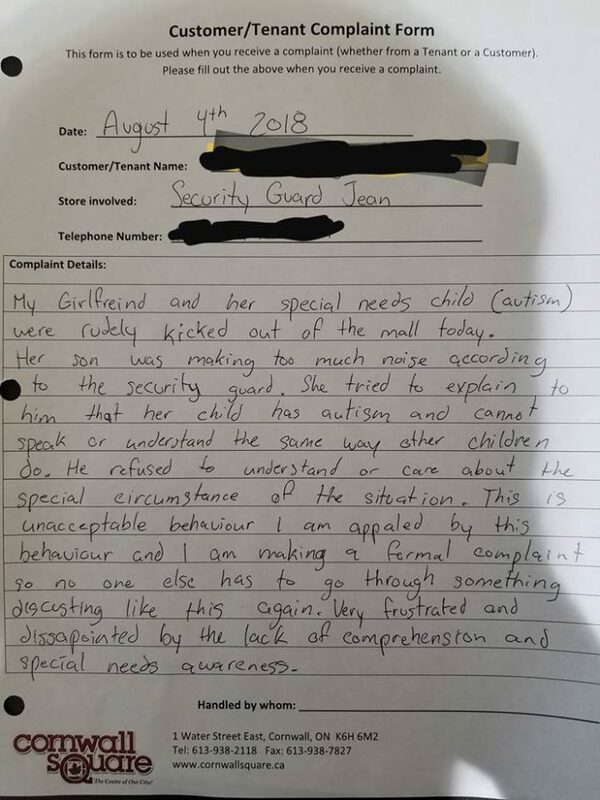 Apparently a security guard took issue with loud noises from the child and not only asked them to leave, but walked with them into the parking lot to make sure they left. For mother Marilyn Ortiz the experience didn’t improve much as she returned Tuesday to talk to mall management. CFN contacted Karen Burns who confirmed we’d get an email from Julie Mayer today, but that email never arrived. We simply wanted to give Cornwall Square an opportunity to respond to this story which we extended the deadline on with no response. Ms Ortiz took to social media with over 100 comments registered between her page and others with most of the comments being supportive to the plight of Children with Autism and their families. Marilyn said that she may be consulting Cornwall Paralegal Daniel Moak about initiating a Human Rights Tribunal case. I want there to be more awareness and acceptance for anyone with special needs or disabilities of any kind. And for people to understand that not all disabilities are visible or clear to notice and that doesn’t mean that they are any less equal if they are. thats horrible i agree. 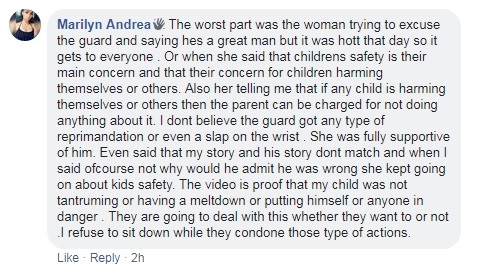 however she did state that her child was “tantruming” because the parents wouldnt walk the direction he wanted to. and then in the other complaint she said he wasnt endangering himself or others and that he wasnt tantruming so im a little confused. Why put the blame on the entire Cornwall Square over the actions of one security guard? So your son has autism and was making a scene and you were asked to leave…not cool…however, I don’t see how this is the fault of every vendor and business within the square…they don’t need this negativity either. I think the security guard went overboard in this situation and can’t believe the management at the mall would try to cover it up instead of dealing with it appropriately since the community is already aware and watching for a response. I don’t think understanding is needed with autistic children alone, but children as a whole. They act up and we must teach them gently what behaviour is expected. Sensitivity training is planned for all Square employees. I remember many years ago shopping with my two monkeys when they were little and when they misbehaved I took them out of the store and I used discipline on them. My kids were normal but at times went off the deep end and I would not tolerate any of that nonsense. The security guard escorted the children and the parent out of the mall and he was right in doing just that. Pete Walbee I understand very well what you mean but the guard is not a psychologist to know what is wrong with the child. The mother should have taken the child out herself knowing that the child has problems. I have seen such children act up even here in Ottawa and the parents let the child scream and have tantrums that have annoyed other shoppers. I was strict with my two monkeys. luckyred so one security guard represents the whole city? Right.